This table consists of a solid amboyna circular top with macassar ebony moulded edge, this opens to reveal a fitted interior consisting of ebonised compartments with ivory knobs and fitments with a circular brass banding to the inner edge, the top can be locked with the working key. This leads down to two tiers of small drawers, the top tier all being dummy drawers, the lower tier having four working drawers and four dummy drawers. Each of the drawers having solid amboyna drawer fronts with ebony cockbeads and rosewood linings with brass escutcheons and working keys leading down to an ebony ball bead moulding. 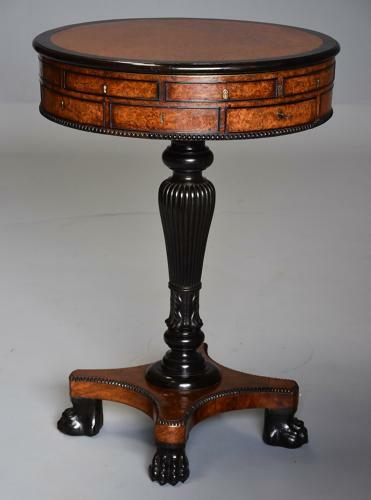 The table is supported by a turned, carved and reeded solid macassar ebony column with carved foliate decoration below leading down to a veneered amboyna quatre-form base with ebony ball bead moulding terminating on ebonised carved paw feet. This table is of English construction but is undoubtedly made by a Chinese cabinetmaker with one drawer having handwritten Chinese signature or symbols. This table is exceptionally rare, is in excellent condition, is of stable construction and can go straight into a home or collection.